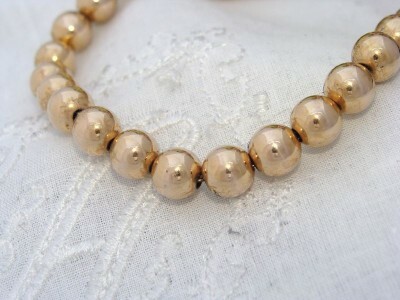 Antique Vintage 12ct 12K Yellow Gold GF Beads Necklace - Wear as Bracelet! WOW! 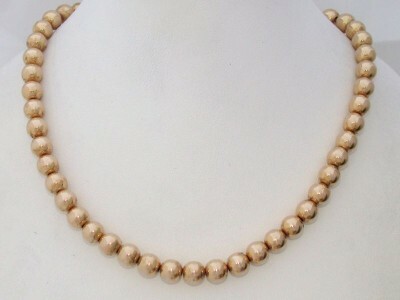 You will be Thrilled with this AWESOME Antique necklace comprised of quality made beads. It is a beauty on & the Quality is unmistakable yet my pictures do not do it justice. The beads are similarly sized with a Yellow Gold hue. They are like pearls of gold and so super shiny. They are strung on a sturdy link chain necklace with the original chian extension with beaded end. For a completely different look, this versatile chain could also be worn wrapped twice about the wrist, as pictured. It has the silky smooth feel usually only associated with solid carat gold and expected of quality antique/vintage jewellery with a warm, aged yellow gold hue. They are very shiny and reflective. Maker: of the same name operating in the early to mid 1900s producing a range of jewellery that was always of the highest quality. Length: 41.5cm end-to-end or 16.25"
NEAR MINT Antique Vintage condition! There is no wear to the finish, dents, repairs or damage; it presents as have been used little if at all which is remarkable for such an old and Truly Beautiful necklace. I have no doubt you will be thrilled. This really has that WOW factor and will not go unnoticed – a very Impressive, Highly Sought After Vintage piece!